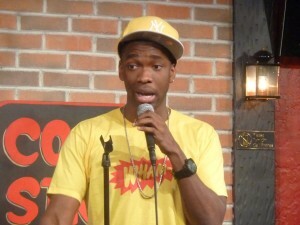 Eddie Murphy Might Do SNL After 25 Years??? Page 6 of the New York Post, the most prestigious, and most powerful gossip column in the country says that Eddie Murphy, set to host the Academy Awards this year,may make his first appearance on SNL in 25 years this coming Satuday night when Ben hosts SNL. The Academy Awards will be produced by Brett Ratner this year. Eddie and Ben recently starred together in Tower Heist, a film Ratner directed, set to open November 4, 2011, which also stars Matthew Broderick, and Alan Alda. 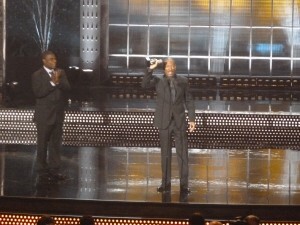 Eddie Murphy receiving the Lifetime Achievement Award in Comedy from Tracy Morgan at the Comedy Central First Annual Comedy Award show! 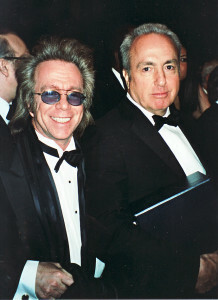 Eddie left the show in 1984, and rumour has it that he had a feud with producer Lorne Michaels over an on-air joke made about Murphy by David Spade, back around 1989, concerning Eddie’s faltering career. 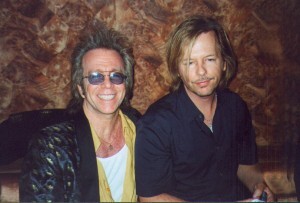 Spade has always been known for his snarky remarks! It’s part of who he is, and what people expect of him! 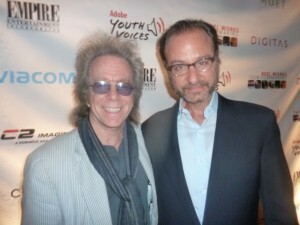 Jeffrey Gurian from Comedy Matters TV with Lorne Michaels at the Writers Guild Awards! 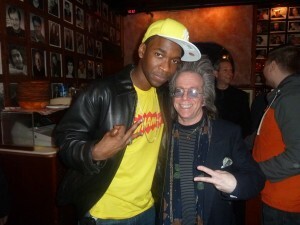 Jeffrey Gurian of Comedy Matters TV with David Spade at a comedy club in NYC! According to Page 6, sources said that Murphy demanded an apology from Michaels which was not forthcoming since Michaels felt he had to give his writers “creative freedom.” Now with Ratner producing The Oscars, and Murphy hosting, it’s felt that Ratner has orchestrated a detente between Michaels and Murphy so we’ll all have to tune in on Saturday night to see what happens. 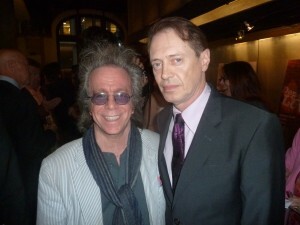 In the meantime, I have a Murphy/SNL story that you probably don’t know. 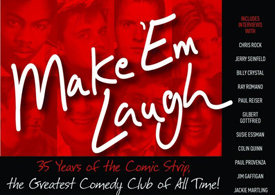 I know it because I’m writing the book on the 35 year history of the legendary comedy club “The Comic Strip”, the club that brought Eddie to world-wide stardom, thanks mainly to it’s owners and founders Richie Tienken and Bob Wachs, who still own and run the place today! 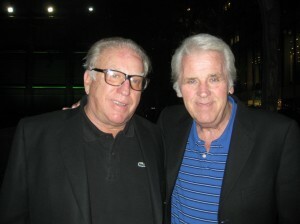 (L-R) Bob Wachs, and Richie Tienken, owners and founders of the legendary comedy club The Comic Strip opened on June 1, 1976, and still going strong! Richie was Eddie’s day to day manager. 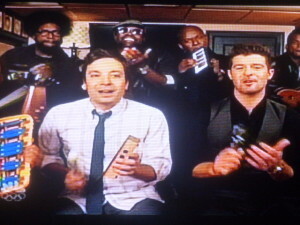 Eddie had been performing as part of an ensemble known as “The Identical Triplets”, two white guys and him! 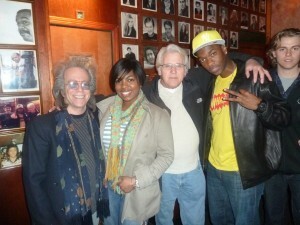 The other two guys were Rob Bartlett and Bob Nelson two respected comics in their own right! Nelson is out in Branson, Missouri, and Bartlett is Don Imus’ sidekick for many years, doing characters on the radio. 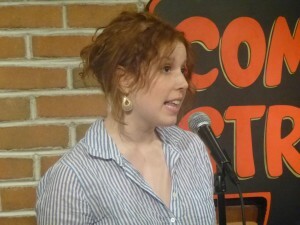 Nelson and Bartlett had been performing at The Comic Strip, and they called up Tienken asking him to take a look at Murphy to see if he could audition there. Murphy was supposed to come in on a Monday night which was audition night, but instead of coming in on the night when Tienken was there, he came in when Bob Wachs was there, who had no idea that Eddie was coming, and didn’t go out of his way to accommodate him. 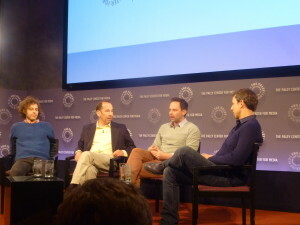 When Eddie got a little testy, expecting to go right up on stage, Wachs basically threw him out. Eddie’s partners called up to find out what happened and Tienken told him to come back on a night he was there. Eddie came back all contrite and acting very polite. Richie told him he wouldn’t go against his partner but told Murphy to go up on stage and if he was good, he’d talk to Wachs. Needless to say, Eddie killed it, and Tienken smoothed it over with Wachs. In 1980, after Tienken and Wachs were managing him, Eddie was added as a featured player on the sixth season of SNL. The producer that year was Jean Doumanian,who went on to co-produce movies with life-long friend Woody Allen. 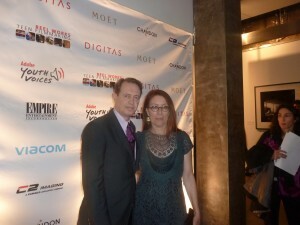 Her ex-husband John is still Woody’s close friend and was with him when I last saw Woody at the Carlisle Hotel this past April. 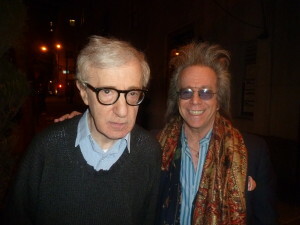 Jeffrey Gurian of Comedy Matters TV with Woody Allen at The Carlyle Hotel in NYC! One night he called Tienken in a panic. 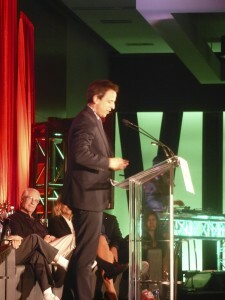 The show was running short, and Doumanian asked him to do five minutes of comedy to stretch the show. She had originally asked Joe Piscopo to do it, but he liked Eddie and suggested him instead. When Tienken asked what the problem was, Eddie said ” I’m nervous to do it cause I curse!” So Tienken advised, “Then don’t curse.” Eddie wound up doing it and saved the show. When it came time for contract renewal, Tienken went up to meet with Doumanian who assured him that Murphy would be re-signed, … as a featured player again. Tienken, as a good manager said, ” He saved your show! 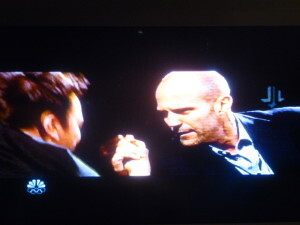 Don’t you think he deserves to be a regular cast member?” Fortunately she agreed, and Eddie went immediately from $750. a week to $3,000. a week, and Tienken proved his worth as a great manager. 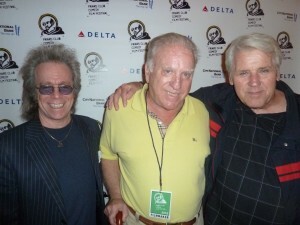 Jeffrey Gurian of Comedy Matters TV with Bob Wachs and Richie Tienken at the Friars Club Film Festival where they were showing the trailer for their documentary film on The Comic Strip! 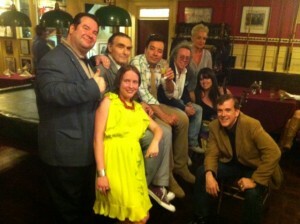 If Eddie is in New York this weekend, they would love to have him drop by The Strip! 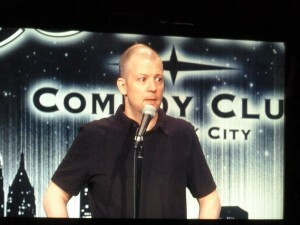 Jimmy Fallon made a rare stand-up comedy appearance in NYC, at the Gotham Comedy Club on West 23rd Street. 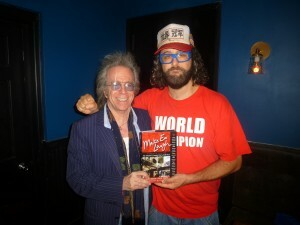 Jimmy sat down backstage with Jeffrey Gurian from Comedy Matters TV in an even rarer video interview, with some great and funny stories from his past and his present. Check it out! 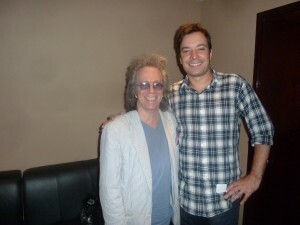 Jeffrey Gurian of Comedy Matters TV does EXCLUSIVE Video interview with Jimmy Fallon! 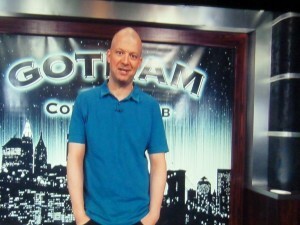 NBC’s host of Late Night, Jimmy Fallon, who’s show is up for 3 Emmy Awards, made a rare stand-up comedy appearance in NYC, at the Gotham Comedy Club on West 23rd Street. 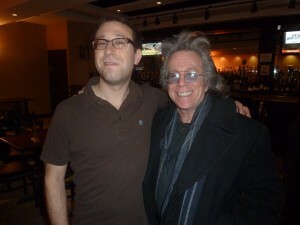 Jimmy sat down backstage with Jeffrey Gurian from Comedy Matters TV in an even rarer video interview, with some great and funny stories from his past and his present. Check it out! 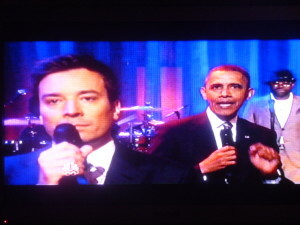 The sold-out crowd at Gotham got themselves a real treat, … 2 headliners for the price of one! 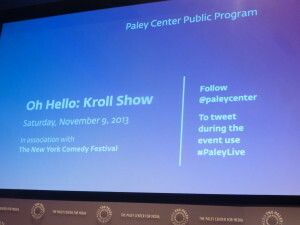 Bobby Slayton, known as “the pitbull of comedy”, (for good reason), packs them in on his own, but combined with Jimmy Fallon opening the show, it was a guaranteed sell-out! 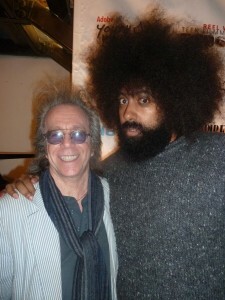 I had just seen Bobby in Montreal the week before at the Just For Laughs Festival, where he also performed. It’s the biggest comedy festival in the world, and needless to say a very prestigious place to perform. 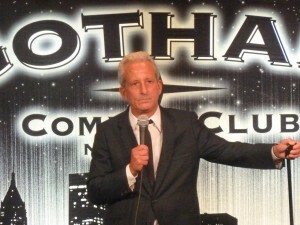 Bobby Slayton, the "pitbull of comedy", on stage at Gotham Comedy Club! 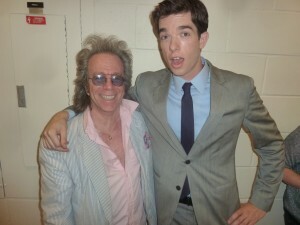 Even he was excited about performing with Jimmy, and he was the one who told me they’d be on the same bill. 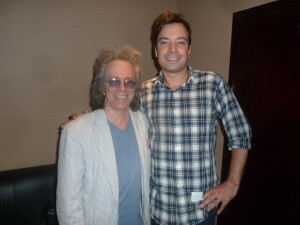 Turns out Jimmy was excited to perform with Bobby as well, plus crowd pleaser Buddy Fitzpatrick was the MC, so it was really a guaranteed success. As soon as I got back to New York, I called Chris Mazzilli the owner of Gotham, and told him to please save me my usual table. Chris advised that I get there early because everyone knew it would be packed. 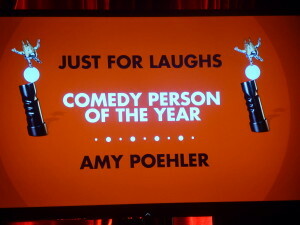 It’s been 2 1/2 years since Jimmy took over Late Night from Conan O’Brien, and the show is up for 3 Emmy’s. 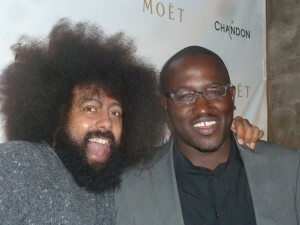 Jimmy is ecstatic, but one of the most humble guys you could ever meet. As well as one of the most talented. 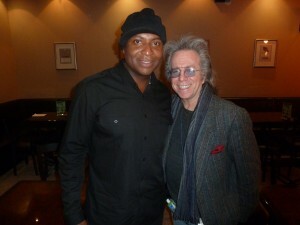 He not only does stand-up, and plays the guitar and harmonica, but his characters are amazing, as are his impressions. 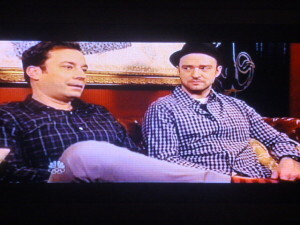 It’s no wonder that he got SNL when he did. He’s one of those rare “triple-threat plus” guys, ( more like quintuple plus! ) but he cautioned me that he doesn’t dance. I’m pretty sure he could if he tried! He does singing impressions of Neil Young and Bob Dylan that are so good you really think it was them. And then he did an impression of every comic who ever performed at Gotham starting with Jerry Seinfeld, who he once had to follow as a young comedian. I went to both the Friday night and Saturday night shows. That wasn’t the original plan. I was originally supposed to interview him after his Friday night set, but he had to leave immediately after the show, so we decided to do it on Saturday night instead. I got the unexpected benefit of being able to see him twice! 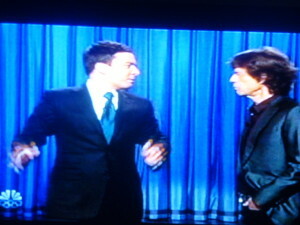 And Robin Williams showed up at the Saturday show, came down to visit Jimmy, and then saw Jimmy do an impression of him. At the last minute my DP Sean Mannion wasn’t able to show up, so I was left to my own devices in terms of filming. Everyone I called was busy, so I wound up at the show myself with my camera equipment, wondering how it would all work out. 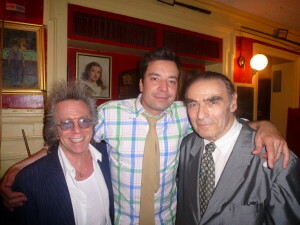 Jeffrey Gurian and Jimmy Fallon backstage after Jimmy's killer set at Gotham Comedy Club on West 23rd Street, in NYC. 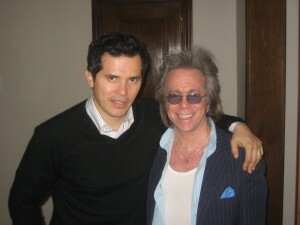 After Jimmy’s set he invited me down to the Green Room backstage, where he introduced me to his lovely wife Nancy, who just happens to be a TV producer. Problem solved! Nancy was kind enough to film our interview. 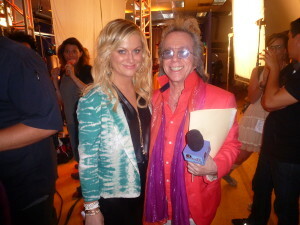 Jimmy was so gracious. I only expected to do about 5 minutes and he gave me 22. Foolishly I was using a tape that only had 23 minutes left on it, so The Universe was watching over me, because when we finished, the camera was blinking on 0:01 minutes. Stay tuned for the video coming shortly!